Thursday already? It seems like it was just the weekend! Some good news for me, I won a giveaway at Katherine's Corner, a really nice one too! One of the items in the package was a $90 credit to Create My Walls. Hello awesome Mother's Day gift!! I've created an awesome gallery wrap for my mom, and she is going to LOVE it. Katherine runs an elegant, but fun and very welcoming blog, and on Thursday's (shameless plug, I know) she has one of the most popular blog hops around, so if you like that sort of thing (it's a great way to mingle w/other bloggers), today's the day. :) And if you're reading this Katherine, thank you again for the awesome giveaway! 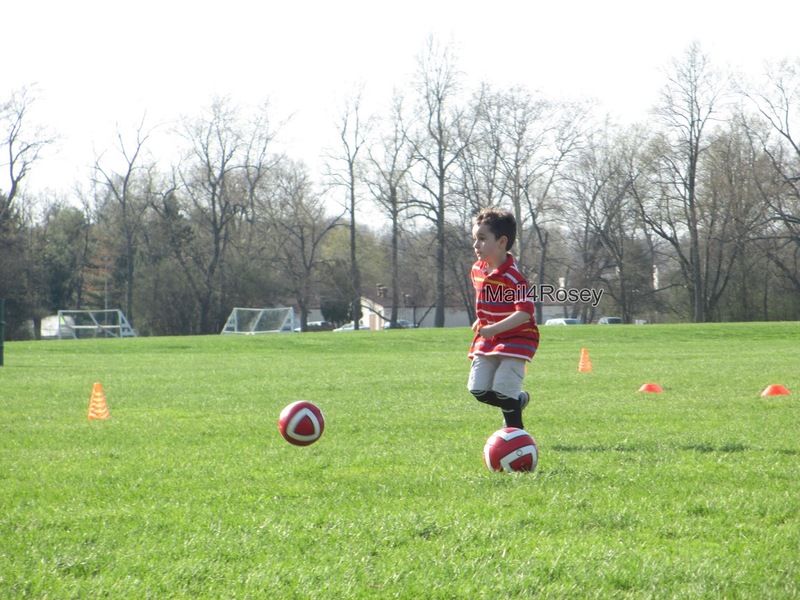 Elsewhere on the home front, our little one had soccer practice again yesterday. He's in love with the game already, and I'm glad. Sign up was a small challenge. We live in a small, rural town, and the local team was full by the time I got around to trying to enroll my Kindergartner (turns out you have to do that almost a year ahead of time around here). So, I made an inquiry into the bigger neighboring city. Sign up there was not a problem. Yesterday the school sent Fall sign ups around for next year's league. $70 for one child (a kindergartner!) to play soccer. We paid $17 in the bigger city, and $2 of that was because we're out of residence. Big difference, I'd say. I'm glad the league in our town was full. $70 seems a bit steep to me for Kindergarten soccer. The last thing I'm thinking about, in this very random list of thoughts...I've got this beautiful plot for a garden in the backyard. It's a really great size, and I've never put a thing in it. It's nicely tucked up against the house, but that's what worries me. If I put food in there, the wild critters will be right next to the house and I don't really want that to happen. Maybe I'll put flowers in there, but it seems too big for that...so I'm still thinking of what to do. Around here, $70 would be a bargain. Sports are expensive and it's unheard of to pay less than $50 for a season of sports - even in kindergarten. Actually, I don't even know of anything the kids could play for that little lol. No kidding! I was flabbergasted. Congratulations on winning the giveaway! My daughter played soccer for several years and absolutely loved it, I'm glad your wee guy is loving it as well. There are several ways to keep critters out of your garden safely, if you let me know what kind of critters you're concerned about I can give you some helpful hints. Have a geat day! Happy Thursday right back atch Rosey!! I don't get any more or less wild animals planting a garden then if I didn't plant one. They come right up on my back porch, maybe because that is where we grill and they can smell the food. Looks like your son is going to have a great time playing soccer and looks like you will be busy driving him there. Congrats on the win and the year book was always fun to get signed. Have a super blessed near-weekend! Congrats on the win, I have no green thumb so gardens go by the wayside. The only sport I never liked was soccer, played everything else, just hated soccer. The yearbook in middle school was always more intimate than my high school books. I think because I was closer to my core group of friends in middle school than we were in high school. I really want to sign my kiddo up for soccer and tball but we don't have the money this year it'll be next year before we do any of this. We want to plant a garden but we have way too many critters for it to be worth while. I'm thinking of doing a window box on my kitchen window with herbs though. I'm glad you got the cheaper soccer deal. Lots cheaper. Doesn't make sense to me either. You'll figure out what to do with your garden or whatever you decide to do. Please tell us when you do figure it out. Yeah I linked up to the blog hop over at Katherine's :o) I'll have to check out the give-a-way! 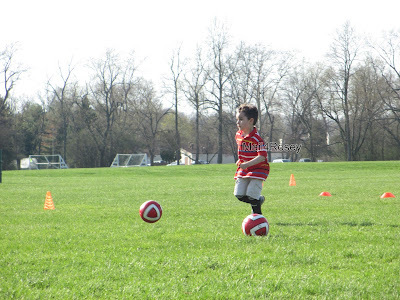 Great soccer shot; my nephew plays soccer and loves it! Hello and good morning, nice to hear you won! Congrats on the wining ill check out the blob hop at Katherine's. Have a Great Day! Hi there! Happy Thursday and the garden idea is a great way to spend more time with your daughter too! Lovely boy! Love sport it`s good for children! Thank you. :) Sports are good for them, I agree. Congrats on the winning! I love winning things! I just won an i Hop Gift Card on A Nut in a Nutshell. It's not my favorite place, but it will be great to go out to breakfast on Mother's Day and not have to pay for much! That soccer does seem expensive. Congrats on the giveaway win! Where did the week go? It does seem to have went by very quickly! I agree, $70 is quite high for soccer, though it doesn't surprise me. We got cheer leading and dance forms for this summer and they want $75 for like 6 classes. No thanks! Congrats on your win! I like Katherine's hop. I don't get a chance to link up each week, but I always find cool crafts and yummy recipes there. Where DID the week go?? And $75 for 6 classes is steep to me too. Congratulations on the win Rosey! Usually everything is more expensive in the big city - isn't that strange? Great way to spend time with your daughter - hope it doesn't just last a day like it used to with mine !!! I hope she wants to do it all summer too. One never can tell w/the kiddos. :) I intend to let her be heavily involved w/plant selection and the like and am hoping that will help. Nice photo, child soccer was my favorite game! That's an awesome price for soccer! We're in a rural area too and I want to say it was around $50-60. They only play in the fall here though. You must be an early riser to be up before your husband's alarm, already do a blog post and then cook breakfast! I try to cook breakfast for the kids a couple times a week, but my husband leaves at 6:00, so I'm never up before him-LOL! How exciting about the garden! It will be a great way to spend time with your daughter. Congrats on winning the giveaway! Congratulations on your win. It's always great to win stuff. $70 wow. I'm glad you said something. We are going to be starting the activities thing with our oldest so it's nice to know what reasonable and not-so-reasonable prices are. As for the garden: If it gets a lot of sun, tomatoes are great. They seem to be very low maintenance. Our watermelon and pumpkins are growing like weeds with all of the rain. Those might be good too. I hope you and your daughter enjoy it. Your little one looks SO CUTE in his soccer get up! I can't wait for Reagan to start playing sports. Congratulations on the win, Rosey! Love the soccer photo! And the garden sounds wonderful -- it's so exciting to plan and anticipate the miracle of growing things! Happy Thursday to you too. I'm glad you won. I think so too. :) Thanks for the visit. Congrats on the win!! I'm so happy for you, Rosey! And Happy Thursday to you, my dear bloggy buddy! Congrats and you continue to amaze me: with your blog, handling your kiddos, writing a dissertation...you're SUPERWOMAN! You go! :) Have a wonderful day! Says that gal who can make Sharpies turn out gorgeous! The end of another school year will soon be here and summer plans are definitely needed. Our summer will be spent clearing up all the trees we had cut down earilier this week. We were able to save a lot of money by doing this job ourselve instead of letting the tree removal service do it. So, we'll be quite busy. lol Enjoy the gardening with your daughter. That sounds like great fun. That's a big job taking down the trees yourselves! Hats off to you! Lucky you Rosey! I have been lucky in a few blog giveaways and it is a real thrill! Katherine certainly has a wonderful blog. Great shot of your son playing soccer. He looks like a budding soccer star. 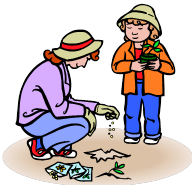 Have a wonderful time gardening with your daughter. Yay on the win :) $70 is cheap for here as well. Activities are really expensive over here. The insurances for the kids are really high. We have personal medical that we carry all of the time, but we don't need additional for sports. Wow! That is steep and I'm very glad you found a better source for your son's soccer sign up. We love soccer here too! Have a great weekend Rosey! Congratulations on the giveaway!! So nice that you'll be able to spend some time with your daughter doing something you love. You're such a fun and awesome mom! Have you joined Lets Get Social Sunday this morning??? If not, lotsa new friends and followers are waiting on you. See Ya There! not sure what sports broxton will play.